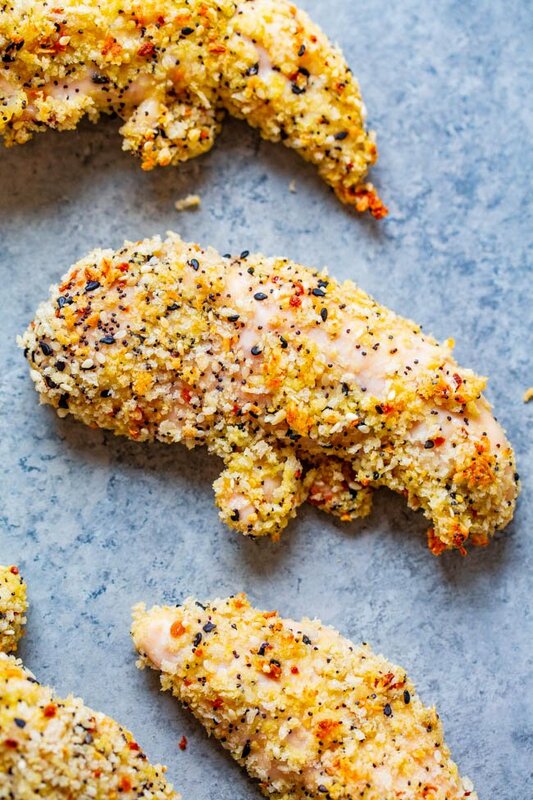 Everything Bagel Baked Chicken Tenders – EASY, ready in 15 minutes, and perfectly CRISPY on the outside!! Tastes like an everything bagel met chicken on the way to the oven and so GOOD! Don’t bother frying chicken when you can bake it!! Why bother frying chicken when you can get so much flavor from baked chicken and it’s obviously healthier. Easy, ready in 15 minutes, and perfect for busy weeknights. They taste like an everything bagel met chicken breasts on the way to the oven. There is so much flavor in every bite. If you like everything bagels, you will love these. These oven-baked chicken tenders are plenty crispy on the outside and are tender and juicy on the inside. I used Trader Joe’s Everything But The Bagel Sesame Seasoning but you can make a quick and easy version of this seasoning. Simply combine 2 teaspoons each: dried chopped onion, dried minced garlic, poppy seed, and sesame seed with 1 teaspoon kosher salt. Leftover seasoning mix can be stored in a small jar, airtight container, or resealable food-storage plastic bag. Use it on so many things like roasted vegetables, in eggs or omelets, stir fries, in pasta salads, on cheesy sliders rolls, or sprinkle it on deli meat before making a sandwich. 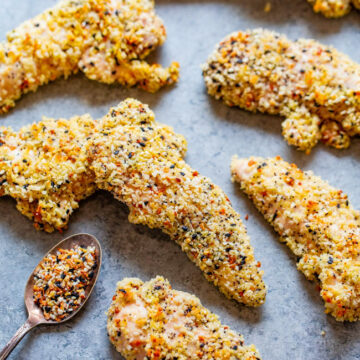 The chicken gets its crispiness from one key ingredient: panko breadcrumbs. Note that panko breadcrumbs are Japanese-style breadcrumbs and are not the same as regular breadcrumbs so don’t substitute those. 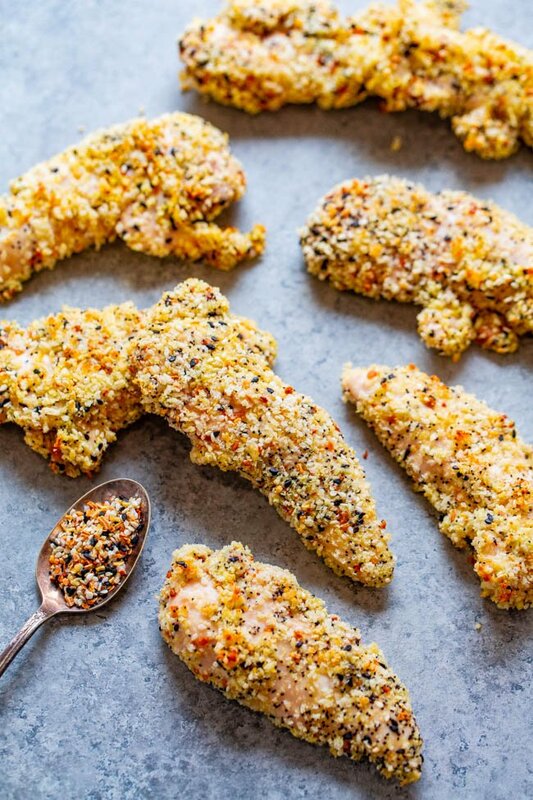 These are bigger, crunchier crumbs and yield chicken tenders that have a lovely crispiness on the outside that you wouldn’t get from regular breadcrumbs. Simply beat an egg, dip the chicken into it, add the chicken to a large ziptop plastic bag along with panko breadcrumbs and the everything bagel seasoning. Seal up the bag and shake. This is the modern DIY version of shake-and-bake chicken. Bake for 15 minutes and dinner is ready. These are also great for game day parties or any time you need a casual appetizer or snack that everything will love. 15 Skinny Chicken Dinners Ready in 15 Minutes – FAST, easy, gluten-free recipes on the SKINNIER side!! You won’t miss the fat and calories because there’s so much FLAVOR! Perfect for busy weeknights and there’s more than than just salads! Sheet Pan Ginger Orange Chicken and Vegetables – Fast, EASY, HEALTHY, and loaded with great orange ginger flavor!! A DELISH one-pan meal with zero cleanup that’s perfect for busy weeknights!! Easy Spicy-And-Sweet Glazed Chicken – Perfectly spicy with just the right amount of sweetness in this EASY, super flavorful recipe that leave you wanting more!! Crispy skin on the outside, juicy and tender inside, and so GOOD! 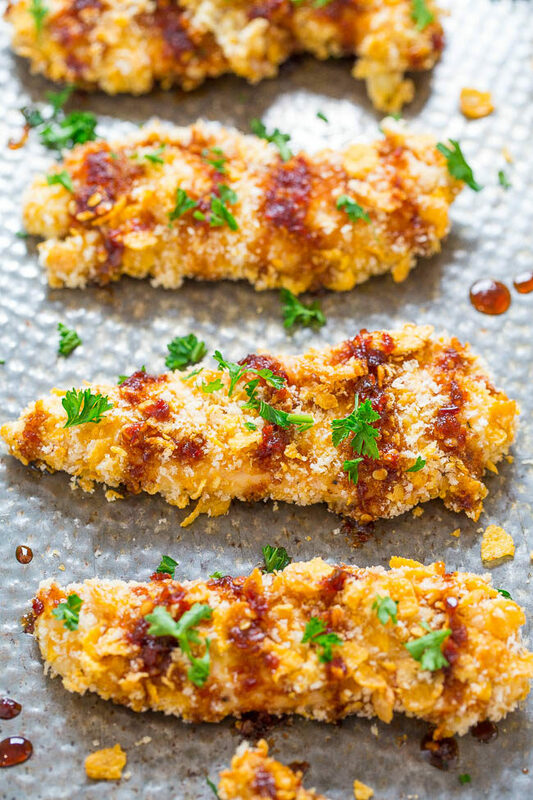 Kicked Up Cornflake Chicken – EASY, ready in 30 minutes, so CRISPY on the outside and tender and juicy inside!! The sauce has the perfect amount of KICK to keep you going back for more!! Preheat oven to 400F and line a baking sheet with aluminum foil for easier cleanup; set aside. To a large ziptop storage bag add the panko, everything bagel seasoning, and stir to combine; set bag aside. To a medium bowl, add the egg, lightly beat it with a fork, add the chicken, and toss and flip chicken with the fork so all pieces are coated evenly. Remove chicken from the bowl using the fork (discard excess egg), drop it into the plastic bag, seal bag, and toss and shake bag to evenly coat the chicken. Place chicken pieces on the prepared baking sheet, evenly spaced. If there is excess panko in the bag, use your fingers to push it onto the chicken in sparsely coated areas. Bake for about 15 minutes, flip midway through to ensure even cooking. Serve immediately with your favorite dip or dressig if desired. Chicken will keep airtight in the fridge for up to 5 days or in the freezer for up to 4 months, noting that reheated chicken will not retain it’s crispiness. 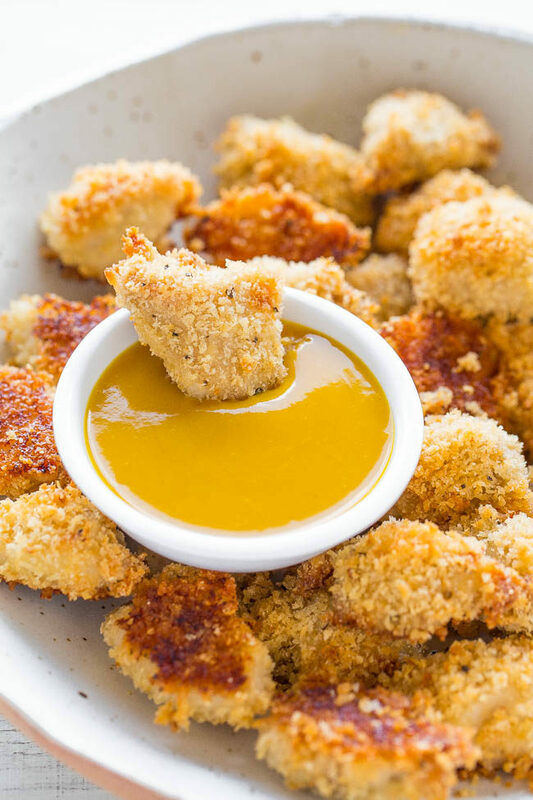 Baked Chicken Nuggets with Honey Mustard – You’ll never guess they’re baked and not fried! Crispy on the outside, tender and juicy inside! Goodbye storebought nuggets because homemade are way better! 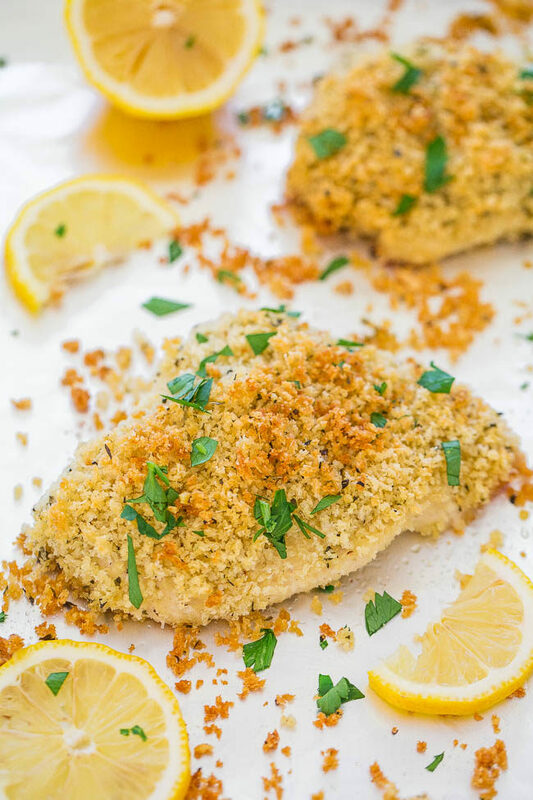 Baked Parmesan-Crusted Chicken – You’d swear this chicken was fried but it’s baked! The interior is so tender, juicy, and moist while the exterior is extra crispy!! Easy, ready in 25 minutes, and so good! 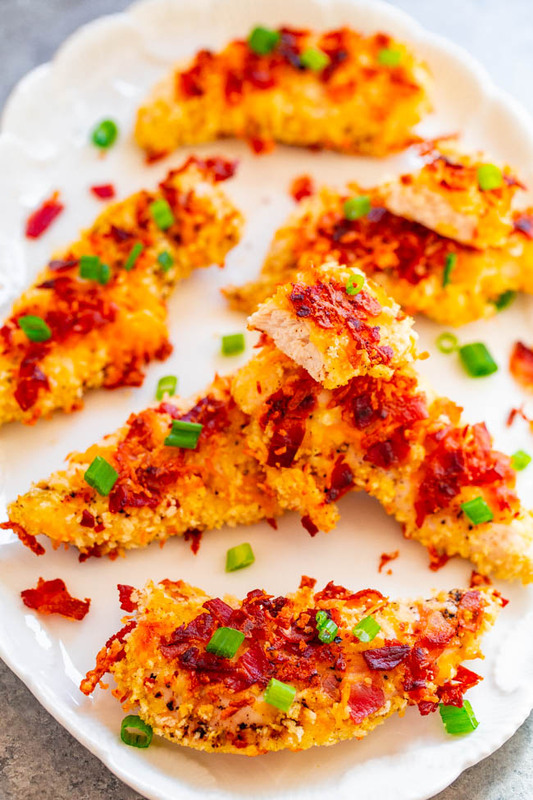 Baked Bacon Cheddar Chicken Tenders – Fast, EASY, perfectly CRISPY on the outside, and juicy on the inside!! Don’t bother frying chicken when you can bake it! The BACON and CHEDDAR coating is irresistible!! What a great idea for chicken! The seasoning looks delicious–it’s a great savory blend and sounds good on veggies too! You can’t go wrong with this seasoning! It definitely jazzes everything up from chicken to veggies! I love this idea! Do you have a dipping sauce you normally eat these with? We have a ton of “favorites” so will likely try a bunch, but if you have one that goes particularly well with the everything bagel seasoning, I’ll be sure to have it on hand. I really don’t have much experience with an air fryer so I cannot give you advice on that. I cooked them in the airfryer for 7 minutes at 320. 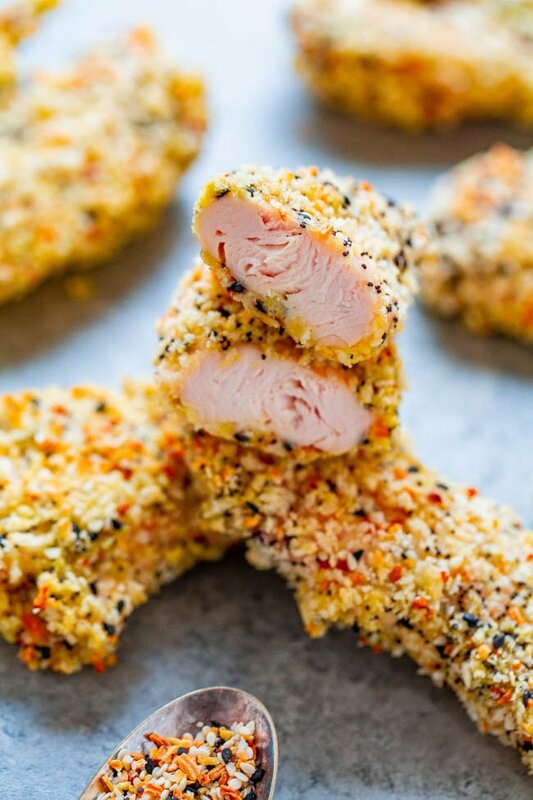 What is the red spice that is in the seasoning in the photo of the everything bagel seasoning chicken. The homemade recipe does not have red spice listed.. It looks delicious. 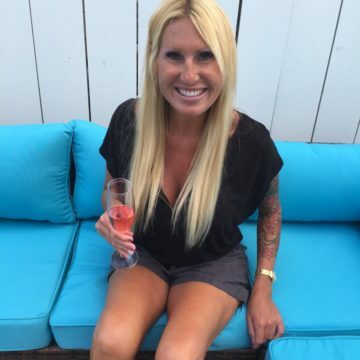 Thank you for sharing your wonderful page. I am new as of today and you are an awesome cook. I am going to make your pineapple upside down cake as a surprise for my grown daughters at Easter. It’s a combination of both the chicken browning/cooking and the spice turning darker as it goldens in the oven. And a touch of red pepper flakes but that is not traditional for this spice blend which is why I didn’t mention it. Excellent! Never would have thought to use the everything seasoning on chicken but it’s superb. Thank you for sharing. Thanks for the 5 star review and I’m glad it turned out excellent for you! It looks in the pictures like there is something red in the “everything bagel seasoning”. What is that ingredient? Someone else just asked this question, read my other comment reply.